Simultanious SDI and Stream output start. I have been testing a livestream setup using Wirecast for a few weeks now for my company. Where a broadcast company that mostly works with live video. 1 of the things they want is sending livestreams to the internet and sending the same stream to a matrix through a SDI cable using a Blackmagic card. as far as i have figured out there is no possibility to start both the stream and SDI output with 1 button, which means there will be a slight difference in the start between both outputs. 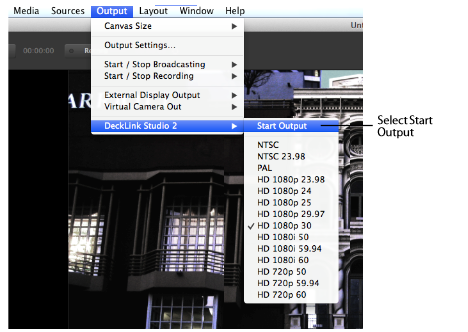 A solution would be if i could add the Blackmagic SDI output in the "Output Settings" menu. so both will start when i press start broadcasting button or shortcut. Another option i would like to see is 1 that has disappeared with the new Wirecast 8. the possibility to change the scale of the separate axis. Before there was a lock option behind the scale bar. this has now disappeared. does not start the Blackmagic Card Output as well? Another option i would like to see is 1 that has disappeared with the new Wirecast 8. the possibility to change the scale of the separate axis. You can now do that directly in the Preview area. Hold Shift Key and move any handle to change scale for that side. CraigS I had requested a similar feature request back for version 7. I like the idea of being able to add the additional outputs right to the output configuration menu so when you hit start everything is up and running. At minimum it would be nice if both the SDI Pro output and the NDI outputs could be started and stopped with a keyboard binding. I could then create a macro key to trigger a sequence to start and stop them all at the same time. Kevin Amos Schmuhl If you have a case number email support with the case number and ask for a status update. I reviewed my previous posts about this and the case number I had was for an issue with the pro output not working correctly. I guess I never actually filed a feature request for this. I certainly can file one now if the OP hasn't already. Are you using WC pro the SDI output requires the pro license. CraigS please confirm this is correct for all sdi output cards. Jaspreet Singh Wirecast Pro supports video out but I don't think it will work with USB Shuttle if that's what you're using. We don't recommend Blackmagic USB Shuttle devices as they've been problematic. Some may use Blackmagic MiniMonitor out.